If you need help translating a word in English or Spanish or if you need translation in any situation, we can help you with our Simultaneous Interpretation and Translation Service*. 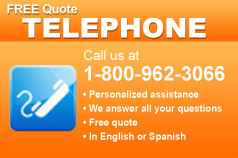 Talk on the phone with any of our translators. Make unlimited calls from your date of purchase. Use this service for 2 years. * Service for 2 years. Service available for 24 months per client. Maximum 10 minutes per call. Period is not renewable or cumulative. Only applies for residents of certain states. The simultaneous interpretation and translation services are not not official or certified. Consult your contract for more detailed translation services.